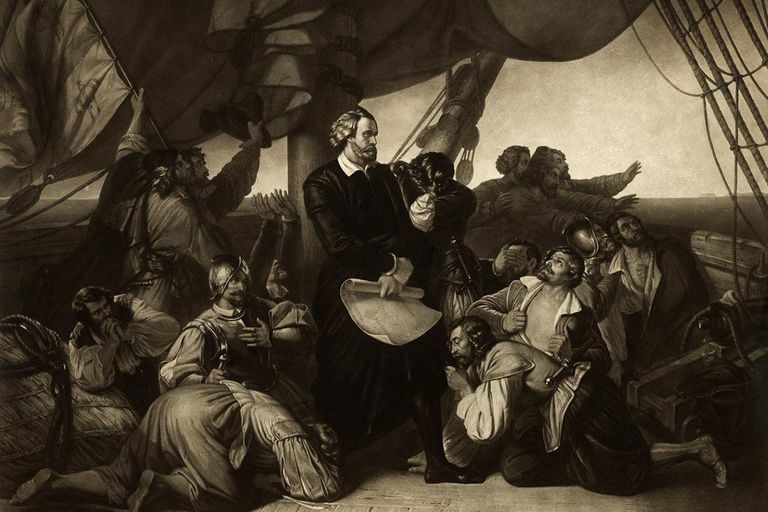 How was the first voyage of Columbus to the New World undertaken, and what was its legacy? Having convinced the King and Queen of Spain to finance his voyage, Christopher Columbus departed mainland Spain on August 3, 1492. He quickly made port in the Canary Islands for a final restocking and left there on September 6. He was in command of three ships: the Pinta, the Niña, and the Santa María. Although Columbus was in overall command, the Pinta was captained by Martín Alonso Pinzón and the Niña by Vicente Yañez Pinzón. On October 12, Rodrigo de Triana, a sailor aboard the Pinta, first sighted land. Columbus himself later claimed that he had seen a sort of light or aura before Triana did, allowing him to keep the reward he had promised to give to whoever spotted land first. The land turned out to be a small island in the present-day Bahamas. Columbus named the island San Salvador, although he remarked in his journal that the natives referred to it as Guanahani. There is some debate over which island was Columbus’ first stop; most experts believe it to be San Salvador, Samana Cay, Plana Cays or Grand Turk Island. Columbus had explored five islands in the modern-day Bahamas before he made it to Cuba. He reached Cuba on October 28, making landfall at Bariay, a harbor near the eastern tip of the island. Thinking he had found China, he sent two men to investigate. They were Rodrigo de Jerez and Luis de Torres, a converted Jew who spoke Hebrew, Aramaic, and Arabic in addition to Spanish. Columbus had brought him as an interpreter. The two men failed in their mission to find the Emperor of China but did visit a native Taíno village. There they were the first to observe the smoking of tobacco, a habit which they promptly picked up. Leaving Cuba, Columbus made landfall on the Island of Hispaniola on December 5. The natives called it Haití, but Columbus renamed it La Española, a name which was later changed to Hispaniola when Latin texts were written about the discovery. On December 25, the Santa María ran aground and had to be abandoned. Columbus himself took over as captain of the Niña, as the Pinta had become separated from the other two ships. Negotiating with the local chieftain Guacanagari, Columbus arranged to leave 39 of his men behind in a small settlement, named La Navidad. On January 6, the Pinta arrived, and the ships were reunited: they set out for Spain on January 16. The ships arrived in Lisbon, Portugal, on March 4, returning to Spain shortly after that. In retrospect, it is somewhat surprising that what is today considered one of the most important voyages in history was something of a failure at the time. Columbus had promised to find a new, quicker route to the lucrative Chinese trade markets and he failed miserably. Instead of holds full of Chinese silks and spices, he returned with some trinkets and a few bedraggled natives from Hispaniola. Some 10 more had perished on the voyage. Also, he had lost the largest of the three ships entrusted to him. Columbus actually considered the natives his greatest find. He thought that a new slave trade could make his discoveries lucrative. Columbus was hugely disappointed a few years later when Queen Isabela, after careful thought, decided not to open the New World to slave trading. Columbus never believed that he had found something new. He maintained, to his dying day, that the lands he discovered were indeed part of the known Far East. In spite of the failure of the first expedition to find spices or gold, a much larger second expedition was approved, perhaps in part due to Columbus’ skills as a salesman.